Does this object look familiar to you? If you’ve ever used a Google Cardboard, or if you grew up playing with a View-Master, you might recognize this stereoscope as a precursor of today’s virtual reality (VR) viewers. The first stereoscope was developed by the British scientist Sir Charles Wheatstone in 1838, just before the invention of photography. The stereoscope shown here was manufactured around 1900 by Brevetés Paris, and it was donated to Cooper Hewitt in 1952. Wheatstone’s device relied on the science behind visual perception to provide turn-of-the-century users with the entertainment of “virtual tourism.” To use a stereoscope, a viewer would insert a special card called a stereoscope slide into the device. Stereoscope slides featured two drawn or printed side-by-side images, placed and sized to align with the device’s two prismatic lenses. Peering through the eyepieces of the stereoscope, the viewer would be visually immersed in what appeared to be a dimensional scene. To the earliest stereoscope users, who hadn’t even seen a film, this experience might have seemed magical. But what’s happening inside the box is not magic. Our brains perceive depth and solid form by combining the two offset streams of images coming in through our eyeballs, a process known as stereopsis. The twin images on a stereoscope slide actually show a subject from two ever-so-slightly different angles, triggering this visual effect in the viewer’s mind. Cooper Hewitt’s collection of stereoscope slides offers a wide variety of experiences, from visits to exotic locales, to observation of events historical and staged, to close encounters with zoo animals — all at a more accessible price point than travel. 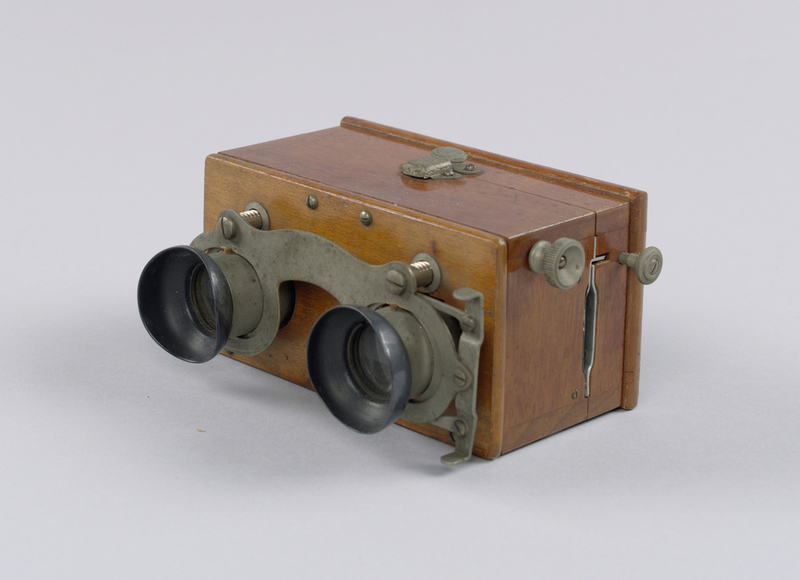 The stereoscope was a simple platform for exploration, much like the VR headsets we play with today. Because the original technology behind the stereoscope was inspired by the activity of our brains, little has changed about the fundamental design of the device in today’s VR headsets. And although the stereoscope slide has long been replaced by digital images and software, it remains up to the user to choose their own adventure.